California Archives - Red Truck Fly Fishing Co. The North Fork of the Yuba River is a beginner’s paradise but a seasoned angler will have a wonderful time as well. The North Fork of the Yuba River fishes best in the summer months after the snow melt has occurred. Snow melt depending on the year is generally finished up by June. The North Fork of the Yuba River is over 60 miles long, most of which is paralleled by highway 49. The hot summer days allow anglers to fish without waders which is a huge plus for beginning fly fishers who may not have waders. We prefer to wet wade as the water is clean and clear. It also makes a quick swim to cool of that much easier. What could be better than sticking a few fish then swimming in the same hole. The best stretch of the North Fork of the Yuba River is the stretch between Downieville and Sierra City. There are literally hundreds of pull outs for anglers to park and walk down to the North Fork of the Yuba River. In my experience your best bet is to fish the pocket water and make only a few casts in each spot before moving to the next rock. This is where you can hone your wading skills by casting while walking to cover wader quickly. If you’re unsure, please exercise caution and stop fishing to move to the next spot. The creeks entering the river offer smaller water but tighter casting quarters. We love these creeks in the mid summer as they offer shade and maybe even a brook trout! The North Fork of the Yuba River is where I take all of my friends and students to learn how to fly fish. The hundreds of eager fish in every stretch of river are quick but very catchable. The North Fork of the Yuba River is the perfect size for beginning anglers to learn how to wade and fish a river. While it is the perfect size it is not the easiest river to wade. So, being in good shape is a prerequisite to fishing the North fork of the Yuba River. Pocket water is a section of water with many boulders protruding from it. These boulders create a buffer for the fish to hold behind, in front of, and along side. I like to fish my way upstream casting my flies all around the rocks. Start by fishing the water closest to you and then work you way out. The beginning angler should cast a hopper dropper rig. If you have cast your flies all around the rock and don’t get a grab move to the next boulder. 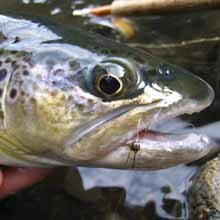 There are hundreds of eager Rainbow Trout and Brown Trout in every stretch of the river. Be persistent and you will catch fish. Fish the pocket water in the bouldery sections of the North Fork of the Yuba River. Fish a hopper dropper rig. When fishing the runs and deeper pools of the North Fork of the Yuba use and Indicator rig. Wade carefully and be stealthy as the water is clear on the North Fork of the Yuba River. More tips on fly fishing for trout. There are many campgrounds on the North Fork of the Yuba. I like the Loganville campground a few miles short of Sierra City. You can reserve a campsite here by calling 1-877-444-6777. There are equally as many cabins to rent on the North Fork of the Yuba River. I prefer The Sierra Streamside Cabins with guiding services from Jim the owner. Our favorite outfit for fishing the North Fork of the Yuba River is the Red Truck Fiberglass Fly Rod paired with the Diesel 3/4 Reel. 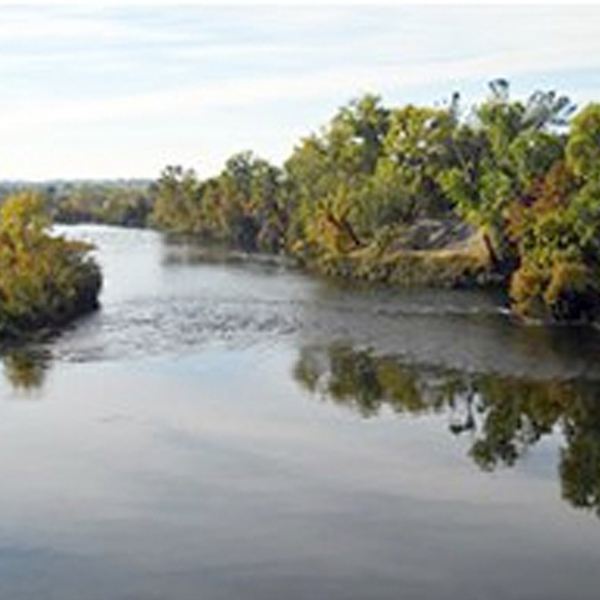 The Lower Sacramento is rated one of the best tailwater fisheries in the US. It flows through downtown Redding, meandering through residential subdivisions, office buildings, and recreational areas. This river is a lifeline for most of California, providing water for central valley agriculture. 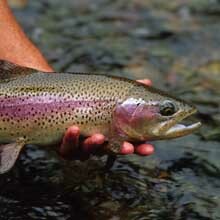 It just so happens that Rainbows that inhabit the river are football shaped and weigh up to 15 lbs. The predominate fishing method for the Lower Sacramento River is by drift boat. Although, drifting can be the most sucessful method; it is not the only method. This rating comes with a caveat. 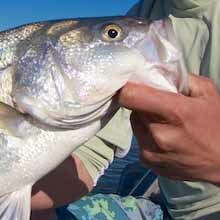 The Lower Sacramento River is a very large river and can be baffling to even expert anglers. However, if you get a good guide a complete greenhorn has a great shot at catching a nice fish. Indicator rigs are the best for fishing the Lower Sacramento. To fish the Lower Sacramento you need a California Fishing License. Casting large indicators, heavy split shot, up to 3 flies, and not to mention the enormity of the fish make the Lower Sacramento River a six weight fly rod river. The American River is a 23 mile stretch of water flowing out of nimbus damn eventually meeting the Lower Sacramento River. This relatively urban river is known for its diverse runs of fish and easy access. The American River’s relatively moderate slope and cobble/gravel bottom makes this river a waders paradise. The first eight miles below Nimbus Dam are characterized by runs and riffles. This is the hot area for winter Steelhead after Jan 1. Below Howe Ave the river opens up into a deeper more lethargic American River. This area is The place to be for the larger Stipers. To fish the Lower American you need a current California fishing license, and a Salmon and Steelhead punch cards. The American River has an abundant amount of access. The American River Parkway travels alongside the American river for miles. Although this pathway is more commonly used for biking and jogging it makes for great fishing access running the length of the river. Watt Ave is another well known access point. Turn off of Watt and park under the bridge where it crosses the American. Sailor Bar is located at the end of Illinois ave. although this is a popular launch spot for drift boats it also offers great wade access. Upper Sunrise Dr. provides some great access as well. 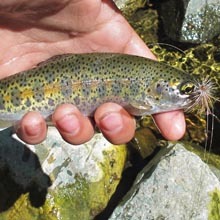 North of Redding, The Upper Sacramento River consists of 35 ish miles of trout filled river that is open all year long. With plenty of public access created by the train tracks that parallel the Upper Sacramento make it a fly fisher’s delight. Diverse in features the Upper Sacramento River boast breath taking waterfalls, trout filled pocket water, and crystal creek pools. Below Lake Siskiyou, the Upper Sacramento is much smaller gaining in size from springs and creeks. The upper river has carved out the steep Box Canyon which creates a much more treacherous wading environment than the lower reaches. 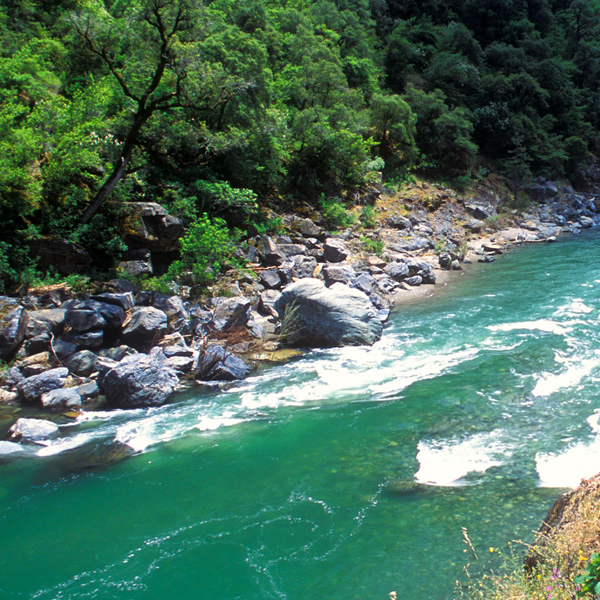 The Upper Sacramento River fills Lake Shasta with help from The McCloud River, The Pit River, and various other creeks. Lake Shasta supplies the water for the Lower Sacramento River and most of the power in the Northern Ca. The Upper Sacramento River can be so kind yet so cruel sometimes. During the heat of the incredibly hot summer days the Upper Sacramento can be quite cruel. While the cool mornings and evenings can be very productive. The wading and access is pretty easy. Fishing in the town of Dunsmuir is perhaps the best place for beginner anglers as it is stocked often. Look out for rattlesnakes on the bank of The Upper Sacramento River. Here is a link on avoiding a rattler bite. Fish terrestrials like grasshoppers during the heat of the day. How to tie a hopper dropper rig. When nymphing, If you are not snagging bottom you are fishing a long enough leader or enough weight. How to tie an indicator rig. Fish smaller flies and light tippet to catch more fish. Ney Springs- You can wade about 2 miles upstream. This very unique section of the river is enclosed by canyon walls. Wading is tough but the scenery and fishing can be pretty amazing. Cantera– This is one of my favorite access points to the river. You hike up toward Ney springs of walk the train tracks down river. While the water is small I have hooked some nice fish here. Mosbrea Falls– While I have never experienced too great of fishing here the 1ish mile hike on the train tracks to falls is well worth the trip. Sims Road– This will take you to Sims falt campground and access to some great fishing. I prefer to hike a mile or so up stream on the tracks. Delta– is a great spot during the hot summer months. Large trout and even bass will come up from Lake Shasta. The best trout fly rod for the Upper Sacramento is a 9ft 5 weight. Our Red Truck Diesel 590-4 is balanced perfectly for the Upper Sacramento River. If you have any questions on the Upper Sacramento River please email us at info@flyfishingoutfitters.com or call 415.781.3474. The Lower Yuba is a 21 mile long tailwater fishery flowing out of Englebright Lake characterized by long runs, crater-like pools, and wide riffles. However, it’s more known for the feisty native rainbows that call this river home. This makes a great river to float in a raft or drift boat but fishing from the bank can be rewarding. Stalk the shallow soft water with a well presented dry fly before pounding it with your indicator or nymph set up. Add more weight to you nymph or indicator rig. Swing a gold bead Fox’s Poopah if casting an indicator and split shot is not your game. Brown woolly buggers swung down and across with a soft hackle trailer. Use 3x tippet. The grabs can be jolting! To fish the Lower Yuba River, you need a California Fishing License and a Steelhead Punch Card. Highway 20 Bridge or Park’s Bar Bridge 18.5 miles east of Marysville on Highway 20. This is the only way to access the eight miles of river below the dam. You can pay $5 to park at Sycamore Ranch Resort which is four miles before Park’s Bar Bridge. This is the best access for below the bridge. Turn right off highway 20 to Hallwood Boulevard where there are a few access points as well. If you have any questions on the Lower Yuba River please email me casey@flyfishingoutfitters.com or call 415.781.3474. The Church, The cathedral, Holy Water, and the Jewel of the West Coast are names given to the spring fed McCloud River over the years. These affectionate names generally will indicate 1 of 2 things: it’s hard to get to or private… Amazing fishing and scenery are givens of course. In the case of the McCloud River it’s both. Many of the rivers in Northern California have been ravaged over gold, timber, and the obvious water. The McCloud River’s rugged surroundings and lack of gold kept both people and industries at bay. The McCloud Dam, forming Lake McCloud, separates the Upper McCloud River from the lower McCloud. The Lower McCloud River fills Lake Shasta with help from the Upper Sacramento River, The Pit River, and various other creeks. Lake Shasta supplies the water for the Lower Sacramento River and most of the power in the Northern Ca. While the Upper McCloud River, home to the Native McCloud River Red Bands is more of a creek than a river. So many words have been written on the blue green wasters and lush yet treacherous surroundings of Lower McCloud River. Most of these words were written by much better writers than me. The Difficulty Rating of the Lower McCloud River – Advanced. Now I am not saying you won’t have a good time if you go as it is an incredibly beautiful place to spend your time. The McCloud River is not the wading nightmare of the Pit River but involves quite a bit of hiking and moderately tough wading. The public water is minimal and gets fished often. Great fly choice and presentation is important. As long as you’re in good physical shape the fishing gaps can be bridged with a good guide. Look out for rattlesnakes on the bank of McCloud. Here is a link on avoiding a rattler bite. Fish dries any time of day in the spring and fall. When nymphing, If you are not snagging bottom you are fishing a long enough leader or enough weight. Cast large streamer quartered up stream near the bank and stripped quickly using the current to form a belly in your line. This is what the big Brown Trout like. Look out for poison oak it is everywhere. If you think you got it on you (you did) rinse all of your exposed skin with cold water river water this will close your pores and rinse the poison off. Heat and sweat open you pours and spread the poison. Ash Camp On the McCloud River- Click the link to see Gps in Google Maps- In the town of McCloud make a left on Squaw Valley road. You take this for about 10 miles over the dam when the rod comes to a T go to the Right. Drive slow and look on your right for Ash Camp. It can be hard to see especially at night. Ash Camp provides great access to the river. AH-Di-Nah Campground On the McCloud River – Click the link to see Gps in Google Maps- In the town of McCloud make a left on Squaw Valley road. You take this for about 10 miles until just before the dam there is a sharp left that takes you to Ah-DI-NAH campground. The 11 mile road is rough… take a sturdy vehicle. This is my favorite place to camp on The McCloud River. There is a trail on the Westside (campground side of the river.) There are a few Primitive campsites in between the conservancy and AH-Di-Nah Campground and the Nature Conservancy Property. 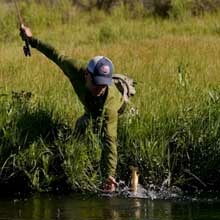 The Nature Conservancy– Click the link to view their website and book – The preserve allows 10 anglers to fish using catch and release techniques at any one time. Five of these fishing places may be reserved a least a few weeks in advance through the Conservancy’s San Francisco office: phone (415) 777-0487. The remaining five fishing spots are available on a first-come, first-served basis. Reservations are held until 10 a.m. of the date reserved. The best trout fly rod for the McCloud is a 9ft 5 weight. Our Red Truck Diesel 590-4 is balanced perfectly for the McCloud River. If you want to streamer fish for the big Brown Trout I recommend our 9ft Six weight Red Truck Streamer rod. Boasting more trout per mile than any other stream in California, Hot Creek is a fly fisher’s paradise. Hot Creek winds its way through the high desert setting of the eastern sierra. Looking at Hot Creek’s moon like landscape one could hardly believe that there are about 11,000 trout per mile. Hot Creek’s bug life is not only diverse but thriving. Hot Creek is quite small in size and requires very little wading. This is good news because the river has been infested with NZ Mud Snails which hitchhiked on angler’s boots from other streams. Make sure to take the proper steps in cleaning your gear or consider a hot creek specific pair of boots if you find yourself fishing Hot Creek often. Hot Creek is spring fed and is largely private with exception of a small stretch below the Hatchery and another below Hot Creek Ranch. Hot Creek flows through Hot Creek Gorge and eventually into Lake Crowley. Hot Creek is a very easy river to wade and fish. There are well worn trails up and down most of Hot Creek. With all of the eager fish and few back cast hazards I would have rated hot creek a beginner river with exception of the water clarity. It does take a bit of stealth to catch fish. Fishing is best in the morning and evenings during the hot summer months. Fish hopper dropper rigs to catch a lot of fish and keep your flies out of the weeds. Cast Streamers quartered up stream near the cut banks and strip fast to catch the large brown trout. Use short indicator rigs and more exact flies as the water moves slowly and the fish have plenty of time to inspect your fly. Upper Public water: If you are on 395 headed south from 203, Turn onto Hot Creek hatchery road. Just before you get to the hatchery there is a parking area. You can fish upstream and downstream from this parking area. Below Hot Creek Ranch: if you are on 395 headed south from 203, Turn onto Hot Creek hatchery road. Pass the hatchery and past Hot creek ranch. You will notice a few pull outs with similar bulletin boards. I usually look for the one with the least amount of cars. Pleasant valley Campground: While not actually on Hot Creek it is on the Owens River. It is a behemoth with over 200 campsites and the closet legit campground to Hot Creek. The epic dry fly fishing on Hot Creek makes the Red Truck 486-4 balanced dry fly outfit the perfect set up for Hot Creek. The Lower Feather River is a 50 mile long river stretching from the base of Lake Oroville, through Marysville and Yuba City, and eventually meets up with the mighty Sacramento River near the Sacramento International Airport. It’s a fairly scenic river throughout this stretch and boasts the largest steelhead run in California’s Central Valley, and one of the best steelhead fisheries in the state. Just below Lake Oroville where the Lower Feather River starts, the river system has a complicated water diversion structure that we won’t get into, however this diversion structure creates two different fishing sections. A “low flow” section and a “high flow” section, and they are called that accordingly. The first 5 miles of river, a section between Lake Oroville dam and the outlet is known as the “low flow” section. It is called this due to the water that is diverted from the lake though the Thermolito Forebay and Afterbay (agricultural water), leaving this section with lower flows. The low flow has four exceptional fishing sections, separated by very long and slow sections that are not very appealing for fly fishing, but can host some big striper on occasion. Its accessibility is bar none due to the fact that it follows hwy 70, and the Oroville Wildlife Area. Below the outlet, where the water flows out from Thermolito Afterbay, starts the “high flow” section. This is where the Feather gets the majority of its flow, usually 2-3X the amount coming out of the low flow. It has many access points, mainly through the Oroville Wildlife Area, which has numerous entrances along hwy 70 near Oroville, then once outside of town it turns westerly and parallels hwy 99 where there are even more points of entry. This section of the river is 45 miles long, and it’s the first 15 miles where the majority of the fishing happens. It has too many fishy pools, runs and riffles to count, and you can cover those 15 miles by driving the dirt roads in the Oroville Wildlife Area. Once you get below Gridley and Live Oak, this is where the Feather becomes wider, deeper and slower. This is where you start targeting the mighty Striped Bass that migrate throughout this great river system. The access is very limited so a boat is a must, however a jet drive is the best bet, as there are many sand bars, logs, a few riffles and shallow water where a prop would get destroyed. Using a trolling motor, or gas motor to get through the frog water/slow sections is a great idea. Especially since the wind has a tendency to pick up mid day and blow straight up the river. To fish the Lower Feather you need a current California fishing license and Steelhead card. The Lower Feather has an abundant amount of access. The Oroville Wildlife Area travels alongside the Feather river for many miles, this is a great place to park and drive to many great fishing spots along its banks. Hwy 70 to Montgomery street, taking a left will take you into Riverbend Park, taking a right will take you into the heart of downtown Oroville and alongside its levy (on the right) where you can drive, park and fish. However this section of the river closes above hwy 70 bridge on July 15th and reopens Jan 1st, also it is closed to fishing above the green walk bridge that parallels State Hwy 70 Bus/Washington Ave bridge near the Feather River Hatchery. Also off of hwy 162 near Oroville, there is a dirt road that puts you at the start of the Oroville Wildlife Area, this dirt road follows the entire low flow section from hwy 162 all the way to the outlet. Coming up hwy 70 just past the East Gridley Rd light, there is a road on the left that goes up and over the levy and will put you down to the river. You can go right or left here, either way will put you onto come great fishing spots. Coming up hwy 99 through Gridley, turning right on East Gridley Rd then left on Larkin Rd will take you to Palm Ave, where you can get on the dirt road and drive up and down the levy as well. Taking you all the way up to the outlet, and driving by some great fishing spots as well. If you get the streamside map, it will show you all these areas. Its large and vast, getting this map and learning its key road ways is keep to having great success. Your 2-day fishing adventure starts in Auburn, CA at 6am. We meet in the parking area behind Raleys grocery store on Lincoln Way. This is where you will leave your car for the night, and pack your overnight gear into our dry bags. Each person is given one dry bag to pack all of their gear for the overnight stay, please pack light and compact. Our fishing and river gear do not get packed in this dry bag, it is for overnight gear only. Once your gear is packed, we will load into our vehicle and wind our way through the countryside to Foresthill, CA. In Foresthill we start the 1800ft. descent into the Middle Fork American Canyon. Total drive time is just under an hour. Once we arrive at Oxbow Reservoir we get the boats and our gear down by the river side. While your fishing guides are rigging the boats for the trip, we will give you a river safety orientation. By 9 am its time to say good-bye to our shuttle driver and head down the river for two days of Whitewater and Wild Trout Fishing. The 1st 4 miles of river contains all the whitewater on our trip. We will run the few class III-IV rapids, and fish the long flat sections between rapids for beautiful rainbows and brown trout (we can and will portage if you do not want to run Tunnel Chute Rapid). After a morning of fishing and rapids we will enjoy a nice lunch and then ripper streamers for the next 4 miles.as we float toward camp. Here we will enjoy one of our delicious river meals as the sun disappears behind the canyon walls.Good company, spirits, and recollection of the day’s events always makes for an enjoyable evening in camp. We sleep beneath the stars, taking in the sounds and other sensations the canyon has to offer. Day-2 will start off early in the morning with a hearty breakfast. We pack up our camp and get ready for a day filled with non-stop fishing action. We will float and wade fish for the next 6-8 miles. There are no rapids on this section of river. We will reach our take-out above Ruck a Chucky waterfall around 5pm. Once our gear is loaded up, we will make our way back up to the canyon rim. It is an easy ten minute drive from there back to your vehicles where we arrive between 6-7 pm. Our trips are world class, and our guides are the most experienced on the river. Our attention to detail in every element of the trip assures your comfort and pleasure from start to finish. We are confident you will enjoy your trip, and want to come back for more. Casey here at Leland / Red Truck. I was privileged enough to join in on a trip last July. Long story short…. this is a trip that some will travel the globe in search of and it’s on our backyard! 2 hours from the SF Bay and you’re in a stretch of water anglers dream about. Keep in mind you won’t access this water on your own, you won’t find anyone with a boat or the skills to navigate this water except for Rise Up River Trips (Robby and Grady). These guys make you feel extremely comfortable with the whitewater as they do all the work as you watch waves of water rush over your head. The food is amazing and the entire operation from shuttle to shuttle is 5 star. Plan on helping haul gear to speed things up, plan on getting soaked, plan on stripping big streamers fast and aggressively all day, plan on a trip you won’t soon forget and will make you wanting more.